If you are a nature lover then moving to the Texas Hill Country was the perfect move for you! Being a resident of Kissing Tree means that you are close to a variety of parks, natural preserves and other beautiful areas to enjoy the great outdoors! Let’s start off with talking about Purgatory Creek Natural Area. 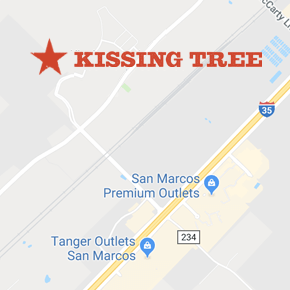 Located right up the road from Kissing Tree in San Marcos at 570 acres this park includes Purgatory Creek, canyon bluffs, dense grass, vegetation and various species of wildlife. There are three different entrances: Prospect Park, lower Purgatory, and upper Purgatory. Each entrance showcases a different geographical portion and includes various trails for any level of hiker. When hiking, make sure that you bring a map and stay on the marked trails. The sheer size of this park can overwhelm even the most experienced hikers, and without paying attention you could easily find yourself lost. Insider tip: there are no restrooms or drinking fountains in the natural area, so be sure to bring plenty of your own water! Next up is one of the most well-known outdoor areas in the Hill Country, the Barton Creek Greenbelt in Austin. When you’re in the Greenbelt it is easy to leave the hustle and bustle of city life behind in the 809-acre park full of swimming holes, sweeping limestone cliffs and dense vegetation. There is something for any level of outdoor enthusiast to enjoy – from hiking, biking, climbing and swimming. The Greenbelt is truly a Texas treasure for all to enjoy. When a natural pool preserve requires a reservation to enter, you know that you are in for some seriously beautiful nature. Located in Dripping Springs the Hamilton Pool Preserve is easily one of Texas’ biggest outdoor attractions. Such popularity resulted in Travis County taking precautions to ensure the preservation of this beautiful space by limiting the amount of people allowed in. Reservations are now required throughout the summer months. Don’t be put off by the idea of reserving a spot, this place will truly take your breath away. The 232-acre preserve has many different hiking trails but the most famous, and the one that you absolutely shouldn’t miss, is the one that leads to Hamilton Pool and its 45-foot waterfall. This is an absolutely stunning place to be, especially in the grotto beneath the waterfall. While these three are only the beginning of what nature has to offer in the Hill Country, they give you an idea of the beauty and grandeur of this area. Your favorite outdoor spot missing from this list? Email us and let us know what you think!